A Cheshire charity who helped support a staff member to recovery have shown their support for World Mental Health Day, today (October 10). 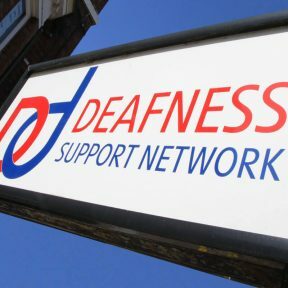 Deafness Support Network employs around 75 people across the Cheshire area and has seen its staff through various life events and health incidents, including depression. One such employ, Pam Craige, who supports children and their families with any type of deafness, had suffered silently from anxiety and depression for years. Her depression cycles became unmanageable after the death of her husband in 2013 and despite having the support of the team, Pam was reluctant to ask for help. Gill Reeder, operations executive, said: “When Pam eventually did come for help, it was such a relief for her and we knew some answers to the questions we were wondering about. We got on quickly with getting her help. The reality was very different and although some (external) support was available during the first couple of years, which did enable me to function at a basic level, I also knew I was a long way from being well. Over the years, my line manager has always been really understanding and very supportive, but for some reason I was reluctant to actually ask for help – I think it was because I (wrongly) thought there was nothing that could help, so getting through each day was just how I thought it would always be. In early 2018 I experienced a number of other setbacks/life events, causing my mental health to worsen, and at that point I finally asked my employer, Deafness Support Network for help. My line manager and our HR manager, promptly made a referral to Occupational Health, and the appointment was within 2 weeks, with a recommendation for specialist mental health support. Before the sessions started, I was mindful of something I had learned over recent years, which was not to have high expectations – but what I did have, was faith that this therapy would result in my feeling better…..even if it was just a little better. After 6 sessions, things were tangibly improving, and after 4 more sessions, I felt so much better – much better than I’d ever thought possible. I know it can be difficult for some people to recognise in themselves, just how unwell they are, or may feel that by asking for help, they might be seen as weak or unable to cope. But the reality for me was completely different, and I will always be grateful to colleagues in DSN, who were (and still are) patient, understanding and very supportive. That made such a difference and was the reason I was able to access the right help. My only regret is that I didn’t ask for help sooner. So that’s really my message…….. if you find your mental health has been/is affected and you’re feeling stressed, anxious or depressed – for whatever reason, talk to your line manager, or perhaps first to a confidante. You will be listened to and supported. Don’t wait any longer to get the help you need.